The journal publishes original full length research papers, short communications and review articles in all areas of agricultural, biological and medical sciences. Emphasis is given to manuscripts which present novel finding pertinent to the biochemical basis of cellular structure and function as well as mechanism of cellular organelles. Investigations directed towards electron microscopy and localization of biomolecules in cells / tissues are particularly encouraged. 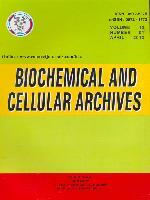 This Journal is abstracted/ indexed by Clarivate Analytics (Biological Abstract, Zoological Records, BIOSIS Previews, Entomology Abstract, etc), ISI Master list, Scopus (Elsevier), CAB Intl (CAB Health Abstract, Nematology Abstract, Entomology Abstract, Forest Product Abstract, etc), Indian Science Abstract, All Russian Academy of Sciences, Medicinal and Aromatic Plant Abstract, etc. NAAS rating of year-2017 for this journal is 4.46 on a scale of 1 to 10. Also included in UGC list of Journals 2017.